Polychain Capital, the cryptocurrency hedge fund founded by Coinbase alumni Olaf Carlson-Wee has raised $200M from Sequoia Capital. The barely one-year-old hedge fund has already made a name for itself in the blockchain and financial investment space, having started with $4M assets under management to now managing upwards of $200M ($400M if you include Sequoia’s investment). 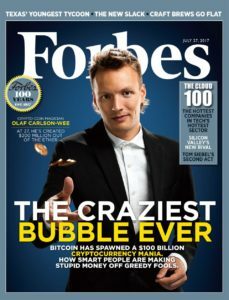 The hedge fund was recently featured on the cover of Forbes Magazine. Prior to founding Polychain Capital, Carlson-Wee previously served as Head of Risk at San Francisco-based Coinbase until mid-2016 where he joined as their first employee. The investment from Sequoia marks a major milestone in the burgeoning token industry – a space in which traditional venture capital investors have been seeking to become more involved but often are limited from investing in tokens and protocols themselves by their fund charters. According to TheInformation, venture capital firms Bessemer Venture Partners and Union Square Ventures plan on investing in initial coin offerings directly which will provide them with direct exposure to the crypto assets. However, such investments are still uncommon among the industry. Polychain’s cash infusion from Sequoia will give the firm broad exposure to crypto tokens that Polychain chain profits on rather than investing LP funds directly into protocol tokens themselves. Polychain Capital has previously raised capital from Andressen Horowitz, Founders Fund, boostVC, and Union Square Ventures amongst others.